Photo copyright 1961, Self Realisation Fellowship, Los Angeles CA. 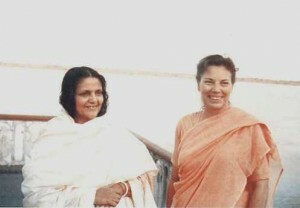 Meeting between Sri Daya Mata and Sri Ma (on 12th of February, 1959) Sri Daya Mata is a disciple of the Paramahansa Yogananda and President of Yogoda Sat-Sanga Society of India and Self-Realisation Fellowship of America. February 12, 1959, was a wonderful day in my life, for on it I met a holy personage, the joy-permeated Ananda Mayee Ma! Many years ago, in Los Angeles, California, U.S.A., my blessed Gurudev, Paramahansa Yogananda, showed me a photograph of Ananda Mayee Ma and said to me “Strive to become like her.” That memory has remained these many years in my heart, and on February 12th I met at last my Ideal in the mother-form. A small group of us came to India from America in October 1958 to look after some organizational affairs of our Yogoda Sat-Sanga Society, founded in 1918 by Paramahansa Yogananda, with headquarters at Yogoda Math, Dakshineshwar. Knowing that Ananda Mayee Ma also has an asram very near Dakshineshwar, I secretly hoped that she might visit it during my stay in Calcutta. That desire was fulfilled, for on February 12th, I attended the Saraswati Puja at her asram, filled with expectancy. As my eyes first beheld the blessed Mother, it seemed that a great dart of love went out from her and struck my heart, leaving me transfixed. 1 remained in that state for some moments, eyes locked on the Mother, feeling great waves of love surging within me. Later our party was asked to go to an open tent where the Mother was already seated on a dais. We were motioned to sit next to her. I could not take my eyes away from her sweet face, so enchantingly full of love. My tears flowed. She tossed flowers to our party. Sri Prabhas Chandra Ghose, Vice-President of Yogoda Sat-Sanga Society, then introduced me to Ananda Mayee Ma. The Mother placed a garland of yellow flowers around my neck and I was plunged into an ecstatic state. When I opened my eyes the Mother gazed long and lovingly into my eyes. What sweetness—what blessing ! I can say no more. She is a divine being. We were served with prasad, while the Mother rested in her room; then we were told to go to the verandah where she would see us. I touched her in deepest reverence and love, just to have the blessing of her sacred hand. She put her hand over mine and gently stroked it. It seemed that my heart would burst with the love and joy that filled it. My tears could not be stemmed in this holy presence that so tangibly reminds us of the great Universal Mother of us all. On the morning of February 13th our party again visited the Mother. She was seated on a wooden bedstead. Our group made their pranamas and left gifts in front of her. Later in the afternoon Ananda Mayee Ma was out walking on the lawn facing the Ganges. Some of our party went forward to take her picture. I remained in the back-ground deeply absorbed in that bliss within. As our group prepared to leave, I knelt silently on the grass, inwardly praying to the Lord within Ananda Mayee Ma for a blessing. I opened my eyes and saw her blessed tiny feet beside me. How tightly I held those feet within my mind and heart! I could not take my gaze away from them, because for months I had been inwardly crying to the Divine Mother to let me see Her Blue Lotus Feet. She had answered my prayer through Her child, Ananda Mayee Ma. After a time Ananda Mayee Ma came in and took her seat on the dais. We sat quietly meditating while she listened to the people who had come for a darshan. How sweetly she smiled on each one ! At times her laughter rang out merrily. She is like a divine child. Our party visited the ashram of the Mother every day that she remained there. Later she went to Calcutta and on the evening of February 20th we went to the home where she was staying, to show her a motion picture film of herself and our Guruji, taken during his visit to India in 1936. Paramahansaji first met her then, in the Bhowanipur section of Calcutta. Later she visited him at his school for boys in Ranchi, Bihar. Gurudev wrote a chapter about her sacred life, in his book, “Autobiography of a Yogi.” That book has now been translated into many Eastern and Western languages, and thus readers all over the world have come to know and revere Ananda Mayee Ma. On February 21st our group attended a kirtan at the Calcutta home where the Mother was staying. Her devotee, Chitra told me that after the kirtan the Mother would see me in her room. When the chanting was over I went to her room. After a time the Mother entered, and as I opened my eyes to behold her, 1 noted her arms outstretched carrying a sari. How thankfully I received this blessing from her—one of her own cloths. She looked at me lovingly while I told her that I sought no counsel, I wanted nothing except love for the Universal Mother, to serve Her and my Gurudev until the last breath in my body. What utter tranquility my soul felt in her presence Our final visit with the Mother was on February 23rd. She was to leave Calcutta early the next morning, and so a vast crowd, wishing for a darshan of her holy form, was present. The Mother had invited our group to see her at the home of a devotee. We went there and sat in front of her, meditating. I found, in Her holy and loving presence, that my consciousness became immediately withdrawn, centered upon the Beloved Mother. On this occasion, as I sat on the lawn, absorbed within, suddenly I felt a tremendous spiritual experience in my spine, centering at the heart chakra. A feeling enveloped me of great, expanding peace, spiritual fulfillment and oneness with the Universal Mother. It seemed, too, that my heart would burst with the great surgings of love that flowed through it the sweetness of which flooded my eyes with streaming tears. After a time Chitra came up-to me and said that I might now present to Ananda Mayee Ma the offerings I had brought, red and pink roses and a silk chaddar. During March and April our party from America traveled to north India. While we were in that area we made it a point to visit the blessed Mother again, this time in Rishikesh, during the “Week of Self-Restraint.” How wise is the Mother to have inaugurated such a period every year, when devotees from far and near can gather about her to receive more concentrated spiritual nourishment from her motherly heart divine. I had other opportunities to see the beloved Ma during this stay in Rishikesh, and above all, to meditate deeply in her presence. During our visit to Rishikesh it seemed that the Mother could not do enough for us, through her wonderful devotees who looked after us. The more I saw of them the more I was impressed with their selfless spirit and devotion. It happened that I was asked to speak before the gathering one evening. I was told that Mother would give me part of her time in the program. I was introduced to the assembly as a disciple of Pitaji Yogananda. I told the audience about Master’s limitless love for the Divine Mother, about his great task in the West to spread the message of Yoga. Then I dwelt on the duty of disciples—the duty to take up the mission of the Guru with ever-increasing zeal and selflessness. Having seen in India how devoutly saints are worshipped, I reminded the gathering that it is not enough to praise these saints and to seek their darshan; that we, the devotees and disciples, must use our lives rightly by striving to follow in their footsteps. Only by constant meditation and good actions may we become divine. The best way, by which we can truly appreciate what the great ones like my blessed Gurudev and Ananda Mayee Ma and other holy ones have to give us, is to become like them. I finished by saying that the only mission of such holy beings is to rouse in us the desire to find the Beloved within ourselves. The next morning, after the meditation in the large hall with the Mother and her devotees, she placed around my neck a beautiful garland of roses. As she gazed at me with the tenderness she showers on all, my eyes filled with tears. I was burning with the divine desire for the Divine Mother and with longing to serve my own beloved Gurudev’s work better and better, with greater humility, love and wisdom. All other thoughts were gone and my soul was afire. “The same spirit ( bhava )that I saw in your Master, I see in you. How deeply was I touched as she spoke of her regard for my Guru. As we were leaving the ashram, beholding for the last time the Mother’s soft, loving gaze, I thought of my blessed Guru, who had chosen, as an eternal example for us, this flower of divinity, Ananda Mayee Ma, through which we have beheld the spirit of the ancient, Holy India he loved so much, and which we too have come to love. (Reproduced from Ananda Varta, VOL VII No 3).